This blog post about our visit is broken into three parts. There is just so much to say and so many interesting photos that I couldn’t possibly have squeezed everything into one post. So, this is part 1; here are part 2 and part 3. After our drive through Geneva, NY, and down Seneca Lake, we arrived at our destination; Corning, NY. I’ve been to a lot of places in New York State, but never Corning (although we did stay in nearby Elmira, years ago). 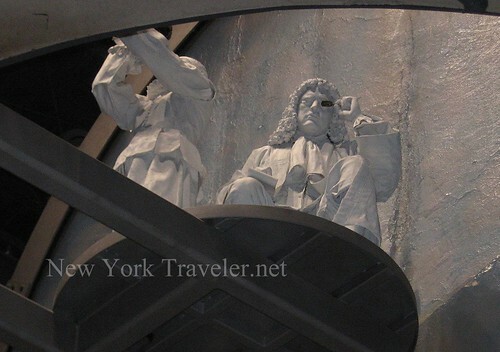 Corning, NY, is in southern New York State, west of Elmira and a short drive to the Pennsylvania border. 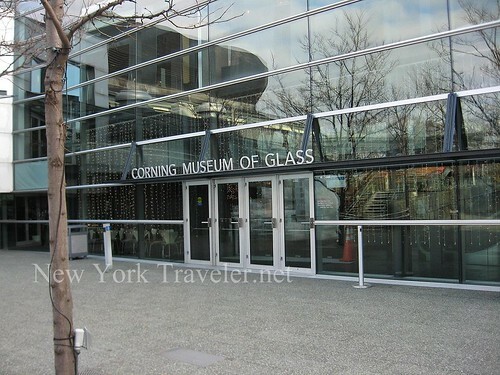 It’s claim to fame is the illustrious Corning Glass Factory and its Museum of Glass. We spent four hours in the museum, and we probably didn’t see everything there! Initially, the kids thought our visit would be “another” museum visit, but they were pleasantly surprised. We walked up to the doors to see a curious block statue. We couldn’t make it out, nor could we quite determine of what material it was made. 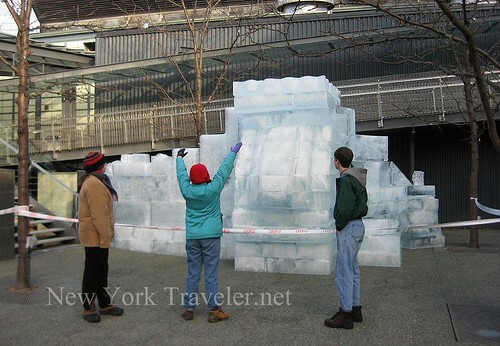 We drew nearer to discover it was an “idol” fashioned in Aztec-style, and was made of ice! The ice was frozen solid. The current weather was no threat to the statue, as it was a frigid 10 degrees outside. My daughter thought the idol was hilarious. She is such a ham. When we first entered the Museum, we encountered scads and scads of gift shops. My first reaction was “The museum is just a bunch of gift shops? !” I asked a saleslady where the museum was, and to my relief she directed us to the back of the complex. We strolled past some very interesting displays on our way there. The kids liked this old truck and wanted to hop in. We encountered a neat machine called a “Marble Machine” done by a famous local sculptor, George Rhoads. It reminds me of those Rube Goldberg inventions. I took a little video of the machine. I apologize for the poor quality. 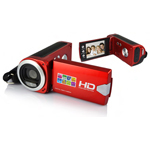 The video turned out moderately well for a digital camera recording, but YouTube’s compression made it blurry. It’s a short video, anyway. The balls spin and turn on tracks turned by gears. The balls’ movements cause bells to gong and gongs to ding. As we continued, oddities met us at every angle– even toward the ceiling. Two white figures perched on a peculiar platform hovered over us. They seemed to be posing in front of a strange honeycombed-looking wheel. We finally reached the area to enter the Museum– I thought it was odd that we had to take an escalator up to the entrance. Admission to the Museum was easy enough. Children under 17 years of age are admitted free! And the Museum has a combination deal with the Rockwell Museum of Western Art (which we would be seeing later), with discounted tickets. Paying a discounted deal for just two adults for two museums is completely awesome. WHAT a deal! 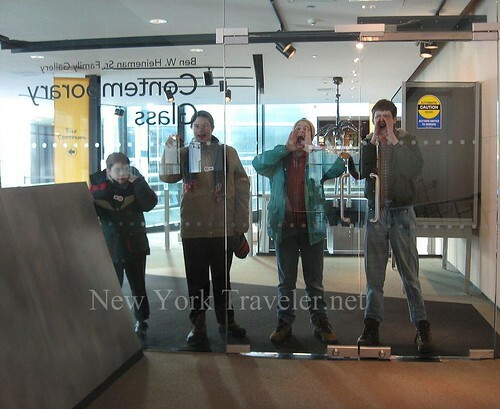 The receptionist explained to us that New York State was hit by a devastating hurricane– Agnes– in 1972. In June 1972, Hurrican Agnes swept up the East Coast and moved inland. The storm hovered over central New York State for a week, producing a steady rain. On June 20, and the next two days, the Corning area received a total of 10 inches of rain. 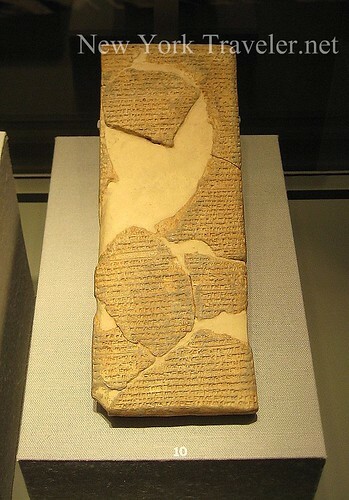 Then, at 5am on June 23, water flowed over the dikes, reaching a depth of more than 20 feet on the city’s Northside. 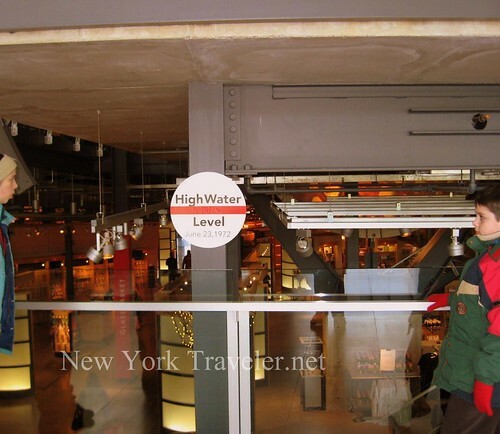 The entire Museum, located in what is now the Sculpture Gallery, was flooded to a depth of five feet, four inches. I looked it up and read that 24 New Yorkers perished from that storm. The loss of those lives and property must have been absolutely devastating. And now I knew why the Museum was all the way in the back and on an upper level. 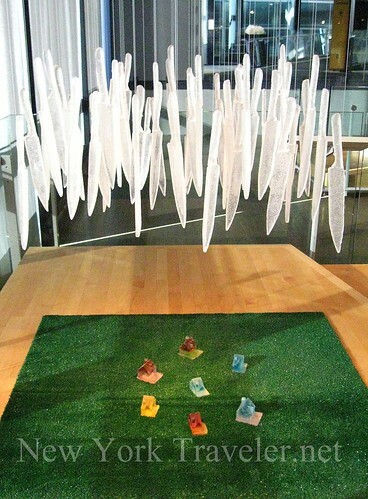 The first portion of the Museum is a display showcasing some of Corning’s award-winning contemporary glass pieces. 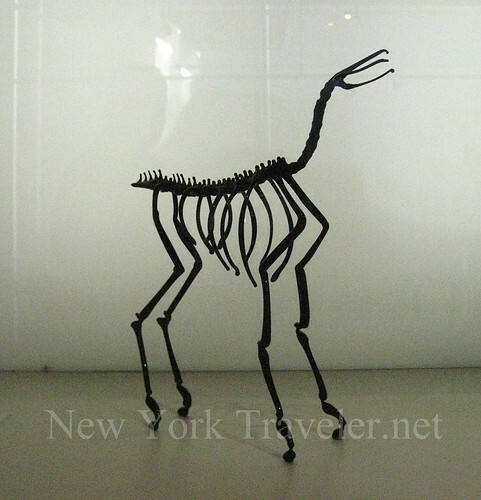 As with most art creations, some are exquisite, some are interesting, and some are weird. I will warn you, dear reader, that I cannot even begin to do this Museum any kind of justice with my photos and narrative. The Museum is truly overwhelming. My poor photos do not adequately describe the wonders of this Museum. 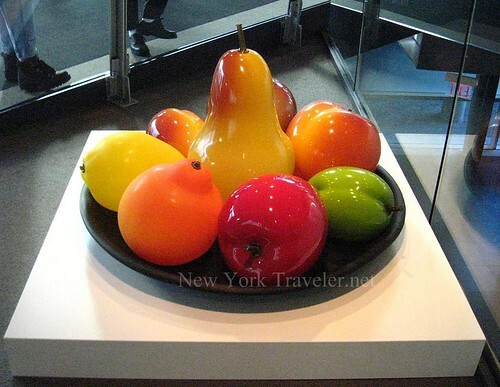 The Corning Museum of Glass has its own website with much better photos– although even the website is not a comprehensive collection of every piece displayed. Still, if you are interested in seeing more and seeing better, go to their website at CMOG.org and enjoy the many stories, photos, and media files there. This beautiful piece– whatever it was of– reminded me of a lady’s crumpled handkerchief. I loved this quirky glass piece! Hmm, someone’s unhappy with the federal government’s mortgage bailout program? Sniffy and I are having fun. 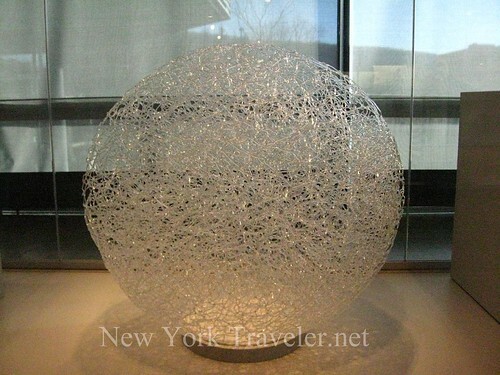 Imagine making this delicate piece from glass! 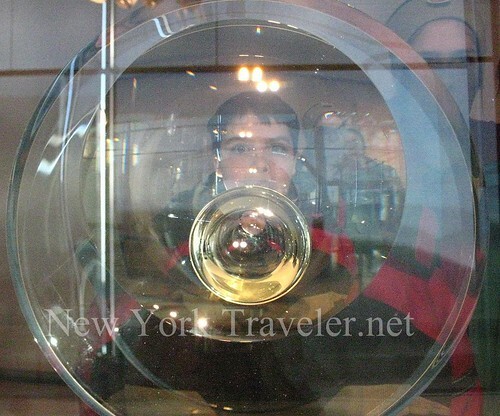 This was neat, too, like the inside of a golf ball made of glass. A giant bowl of fruit. I love the bright colors. These pieces and so many were delightful… but I thought, “Is this all there is? Just contemporary glass objects? No artifacts?” Once again, I was pleasantly surprised; well, more like elated! We had only just brushed the surface of things to be found in this tremendous museum. The kids are impatient to move on. 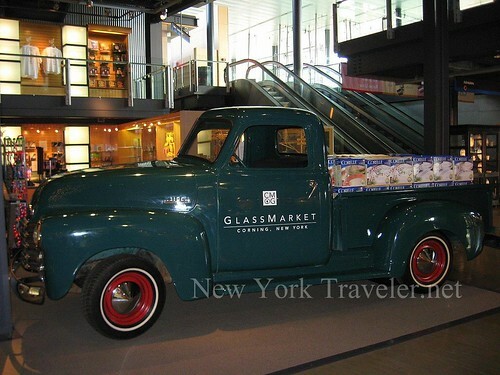 We now entered another section of the Museum that showcased the history and art of glassmaking. Woohoo, this is right up my alley! All I could do was walk around, starry-eyed, and utter “wow.” Everyone else probably grew so tired of my exclamations, but the displays were stunning. This was my favorite part of the visit, and I don’t think four hours here was long enough. Of course, the Museum’s displays were set up in chronological order. Upon entering, there was a life-size reproduction of an Egyptian furnace. 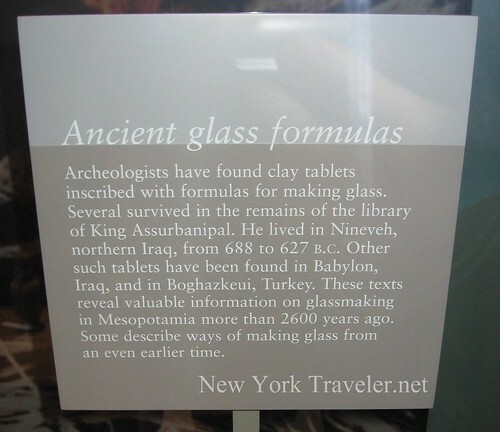 The history of glassmaking goes back to 3000 B.C. and older. 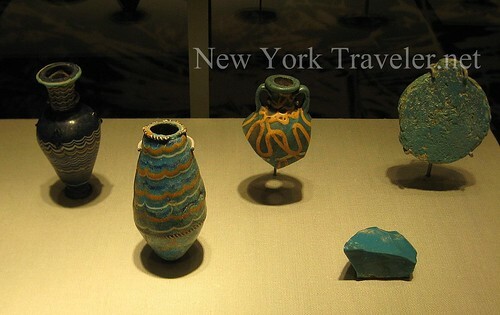 It is estimated that the Syrian-Iranian peoples discovered glassmaking. As the centuries flew by, glassmakers made discoveries and innovations (and technologies) to aid their craft. 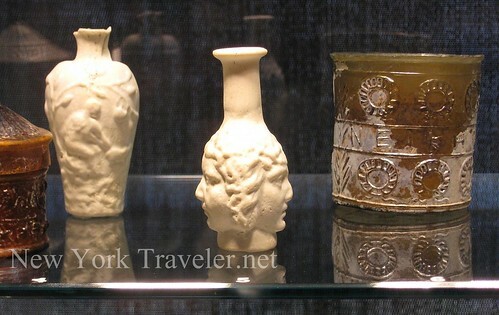 Glass objects, once crafted for the very wealthy, became more common and were developed for common household purposes. Early glassmaking was called “core forming.” Blown-glass was a much later development. Watch this wonderful short video from the Museum about core-forming. Here are some Egyptian core-formed pieces. The most notable things about viewing the objects in chronological order is instantly observing the development of industry over long periods of time. 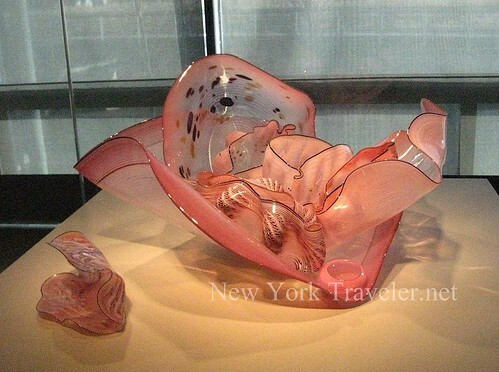 Plus, the art of the glass objects themselves spoke of the people’s own ideas about art and life. Here’s an example. 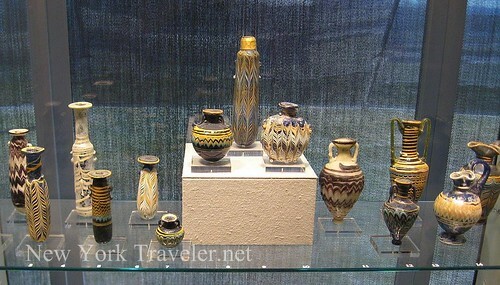 Look below at the beautiful objects made in ancient Greece about the 1st century. The detail is exquisite! The faces on the glass object are clean and clear. 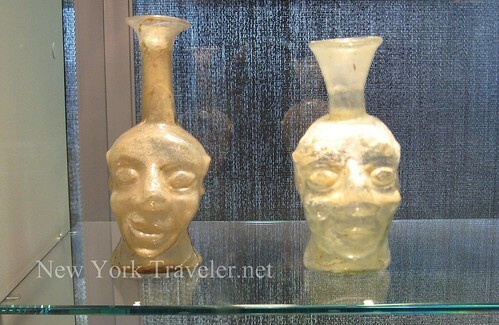 Now, look at these glass objects from barbarian Europe. They were crafted by the Germanic and Frankish tribes sometimes in the 3rd or 4th century. They are grotesque and clunky, even though these objects are 200-300 years later than the Greek pieces. I studied Art History as a young student, so these things fascinate me. You can look at art and see the artist’s thoughts– how the artist felt about himself, his culture, his available tools. I love art study for this reason. I’ll end part 1 of our visit here. Stay tuned for part 2 and 3! The fun gets funner! glasses at prices you can afford, look no further. Sign online today and find the best in glasses frames and so much more! 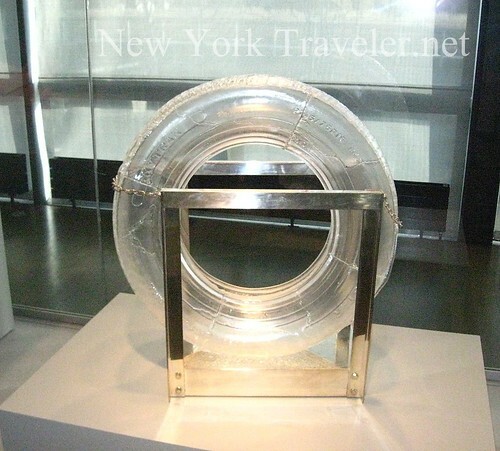 Love the Blog, just wanted to explain what the ice sculpture at the Museum of Glass (CMoG) was. Every month during off season CMoG puts on an event for the community called 2300 degrees, there is usually food, wine and a band, as well as shows by glass artists. Hi, Paul! Thanks for visiting my blog. And thank you for lending insight on the ice sculpture. We were surprised to see it when we neared the entrance! What happens when the temperature reaches above 32 degrees? Y’all come back now…preferably sometime when the museum is hosting its monthly dance party for the community…”2300 degrees”! Free food tastings, or more substantial for sale at decent prices, wine tasting, reasonable wine and beer, FREE water and sodas. Everyone brings their kids and a great time is had by all…none of this kids whining bit! Everyone (5- 75)stands there and rocks out en masse (google 2300 degrees, you’ll find photos!). I call it “white people tribal dancing”. The bands are ones that no one else could afford..the Horse Flies, The Town Pants, Entrain (!!! ever my favorite, i LOVE to dance! And I’m 65..). Always glass -blowing and other entertainment…the tiki sculpture your kid is worshipping was made for last Jan. “2300”- theme, “Fire and Ice”. Third Thurs. of every month, Nov -March, 5:30 – 7:30 (early so all can enjoy). 2300 degrees is CMOGs gift to the community, an attempt to subvert cabin fever! GREAT photos by the way..i found you whilst googling to find out who is playing at the Dec, “Solstice”, 2300! All I can say is, WOW! Look forward to making a visit when I come to NY next year. That Barbarian Europe stuff is awesome.